I have had dogs as companions all my life, starting with my childhood dog, Petie, a Scottish terrier, who was given to me when I was about 6 years old. He didn't like children very much but, fortunately, never realized that I was a child. He lived to be 18. 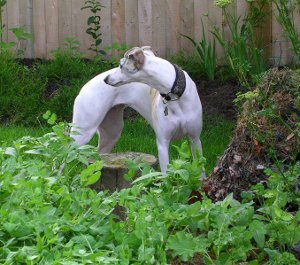 Thereafter I had a wide variety of other dogs: mixed breeds, another Scottie, greyhounds rescued from the track, and now a whippet. 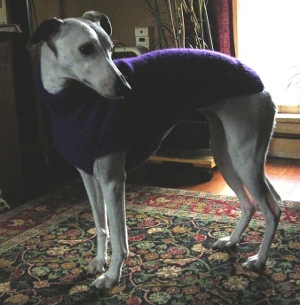 Greta Garbo, one year old, complete with name, came to me in 2003 from a wonderful whippet breeder, Dianne Reimer. 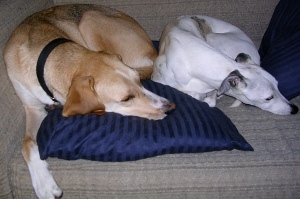 Greta shares the house with my husband's dog, a Coonhound mix named Duchess (and yes, we each have our own dog and always have). They are good friends. Greta has entered obedience competitons and has her CD title (Companion Dog). 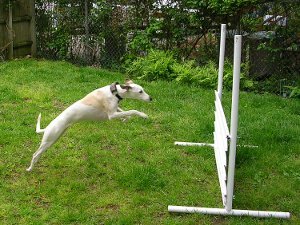 She continues to take obedience classes at New England Dog Training Club, working in Open (and yes, she did make that jump). 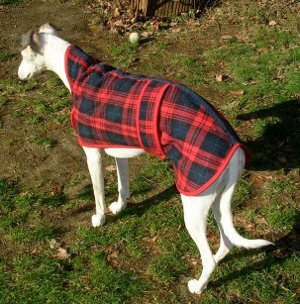 She also takes agility classes and nosework classes at City Dog Training. She enjoys playing in the yard or just hanging out looking for squirrels. 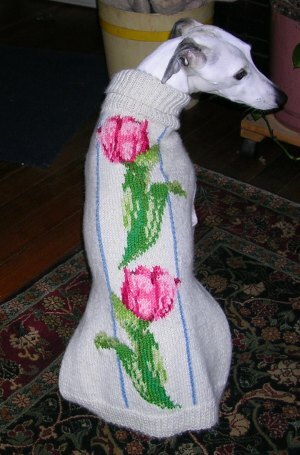 I love to knit so Greta is quite well dressed. 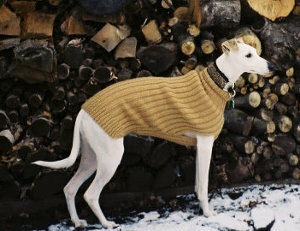 As a whippet she doesn't have much fat to protect her so she minds the cold (unless she's out playing, when she never finds it too cold). 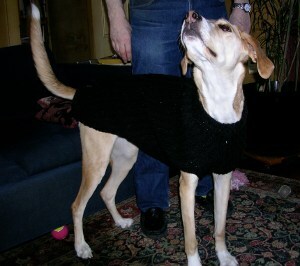 Here are some sweaters that I made for her. When I first got Greta she would hunt worms in the garden. She'd listen with her head cocked, dig a bit, and, without hurting them, simply relocate the worms to elsewhere on the lawn. I told my friend Laura about Greta's game and this poem is the result. Greta Garbo dances through the garden. so light she scarcely dents the mud. 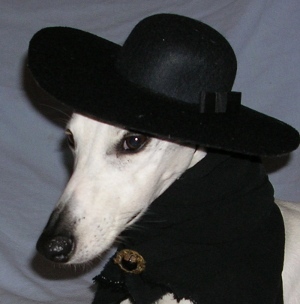 and be dangled from her snout. seeks out the next hole, fine as a needle-poke. 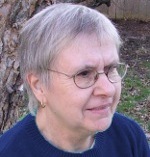 Appeared in HAUNTS, Cooper Dillon Books, 2010. Reprinted with permission of the publisher. It all started by chance. When I moved to an apartment with a tiny yard, I found that I would have to get rid of the roots of long-dead forsythia before I could do any gardening at all. 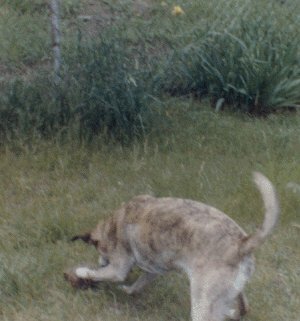 When I started to dig around them, my dog Gillian, a 35-lb. 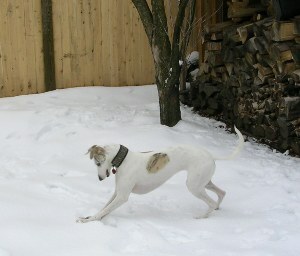 whippet mix, joined me. Fortunately I ignored my first thought, which was to stop her so she wouldn't acquire the bad habit of digging up the garden. I let her continue and she kept working around the roots until one by one I could pull them out. This incident didn't impress me greatly though it certainly was a help. It wasn't until months later, when I was faced with planting fall bulbs, that Gillian set to work again, offering help for what I thought was going to be a tedious job. 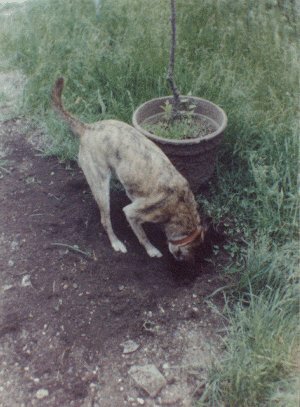 When I put the trowel into the ground to dig the first hole, she began digging right next to the trowel and willingly stopped at the right depth when I asked her to. I planted the bulb, watered it, and proceeded to the next. Since she didn't like to dig up wet earth, she was happy to turn her attention to the next hole and my bulbs were planted in no time. 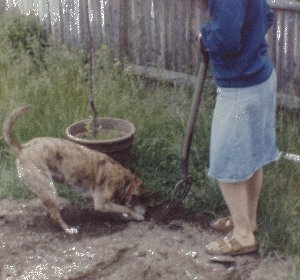 From these humble beginnings developed my "gardening dog." In 1983 when I moved to a house with my own piece of land to work, Gillian turned out to be a tireless and dependable worker. When I laid out my vegetable garden, she worked at my side, digging beside the pitchfork, tossing soil, digging out rocks and stones, turning the earth, and keeping at the job until I called a halt. Her love of buried rocks was especially helpful. She dug them out with enthusiasm and removed them to the lawn, where I could easily gather them for disposal. Perhaps she was a trifle sloppydirt flew everywherebut she was willing to be repositioned so dirt fell where I wanted and the rest could be raked back into place easily. She wasn't always accurate and at times I got covered with flying dirt, but then gardening is dirty work anyway. Once the garden was planted, with sticks and string defining the boundaries, she never entered it againif her ball rolled inside she waited at the string for me to retrieve ituntil autumn when the plants died and the sticks and string were removed. Then she might even go in to retrieve her ball herself or retrieve a stray cherry tomato, but she wouldn't dig in the garden until planting season. 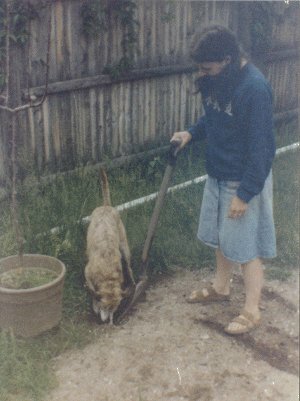 Gillian eventually participated in many yard projects. When I finished laying out the vegetable garden and wanted marigolds scattered around the borders in a "natural" arrangement, I let her select the places to dig the holes and got the natural effect I was after. 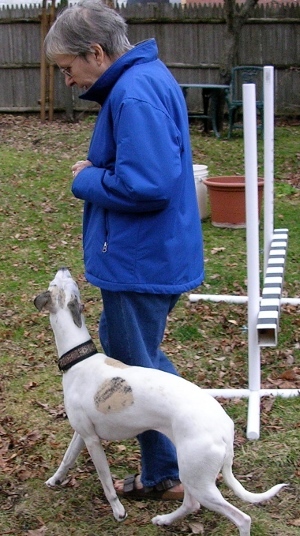 When I needed three-foot deep holes for cement footings for a porch, however, I did exceed her abilities a bit, since she couldn't reach beyond two feet and needed to ask for human assistance. She more than made up for her limits, however, when a foot into the first hole a long-dead root of a long-gone tree appeared. While I puzzled over how to get hold of it, Gillian jumped into the hole and started a tug of war that ended with the root lying next to the pile of rocks she had already retrieved. When compost needed turning, there was no better worker than Gillian. She dug, rolled, dug some more, and aerated the heap as no human would have the patience to do, though I do recommend a bath for any dog engaged in this particular pursuit. Gillian gets down to serious work. She finds a stone, removes it, and plays with it for a bit. She has removed objects as large as half a brick. For larger objects, she uncovers them and then barks at me until I remove them. She voluntarily resumes work after her rock break. Except for pauses to remove and pile up rocks and roots (bottom of photo), she digs until the hole is large enough for the tree. With a certain disappointment, she contemplates the end of her favorite work. Gillian and I equally enjoyed gardening together. She always barked with excitement when I picked up the trowel or pitchfork. My only problem was thinking of enough projects for her. 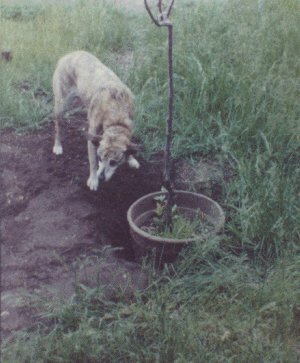 On rare occasions she would go to an empty spot in the yard and dig a hole just for the fun of it-I always felt that I ought to find something to plant in it and often did. 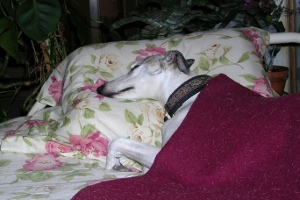 As she got older, her abilities faded a bither vet once prescribed for a pulled muscle, "No gardening for a week"but her enthusiasm never waned. She lived to age 18, testifying to the healthful life of a gardener. I garden on but it will never be the same without Gillian.